Warframe is one of the most successful free-to-play games of all time. Developer Digital Extremes has supported the 2013 game, which launched with the PS4, with numerous updates throughout its nearly six year lifespan. The latest massive update, called Fortuna, released in November 2018, following a huge reveal in July at the third annual TennoCon in Ontario, Canada. This expansion has already seen two large content updates. The second Fortuna update, Operation: Buried Debts has officially launched across all consoles, and we have the details for you to read over while you wait for the download to finish. It should be noted that, despite doubts from Digital Extremes about the feasibility of cross-play for their most popular game, this update has released barely two weeks after its debut on PCs. Granted, there is much more to cross-play than simply keeping version numbers aligned, but it seems that the developer has a hold on following PC releases quickly on consoles. So, what’s in Operation: Buried Debts? According to the press release, “Tenno [in-game name for players] must work alongside the community and Solaris United to locate, uncover, and solve a multi-part Operation and the mystery lurking below the surface.” In a nutshell, it’s a community event where global progress will help to unlock various items. The PC community has, naturally, progressed quite a ways. Progress will start fresh on consoles. Alongside new missions for players to take on, Warframe’s melee system has been revamped. Dubbed Melee 3.0, Digital Extremes says that “Beyond instant weapon-melee switching, when interrupting a melee combo with gunfire, dodging, bullet jumping, or any parkour, players’ next melee attack will resume the combo where it left off (within a window).” So this means you can potentially begin attacking an enemy in front of you, shoot his comrade to the left in the head, and quickly (and seamlessly) continue slicing up your original foe without skipping a beat. If that wasn’t enough, the 39th Warframe was also released. Hildryn uses shield energy to power her abilities, which is different from most Warframes. Hildryn possesses abilities which can cause multiple enemies to float in the air while also dealing out damage. She seems to be geared as an offensive/tank class, able to turn groups of peons into cannon fodder. Using shield energy in place of regular energy is strange at first, but it most likely feels like second nature once players grasp the usefulness of her abilities in various situations. Warframe’s Operation: Buried Debts update comes in at around 2.3 GB in size, if you have your Warframe client up to date of course. Otherwise, you’ll be in for a larger download. 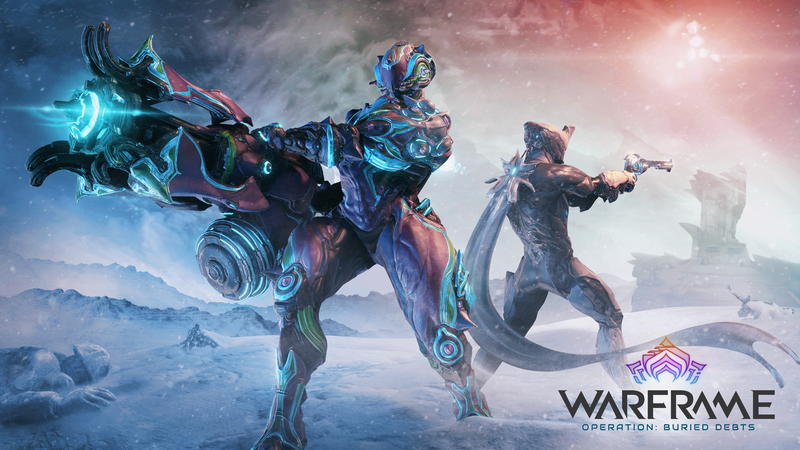 Do you plan on purchasing the new Warframe Hildryn? Or will you grind out the necessary components to build her yourself, as the game so famously allows? Is the current pace of updates for consoles acceptable? Obviously, releasing the same day everywhere would be ideal, but given that consoles have a quality review process, it’s understandable that PC players see updates first—the running joke in the Warframe community is that PC players are beta testers. Let us know your thoughts in the usual space below.